The Rainbow Project of Northern Ireland believes that every service can and should be accessible to LGBT people, and they seek to provide professionals with the understanding, skills and confidence to be able to provide the best support for LGBT service users. What is sexual orientation and gender? What are the experiences of LGBT people in Northern Ireland? What are the different forms of homophobia and transphobia? How do we remove barriers to accessing services for LGBT people? Day Two (12th) is a session facilitated by one of The Rainbow Project’s counsellors, to explore with participants how best to provide therapeutic support to LGBT clients. 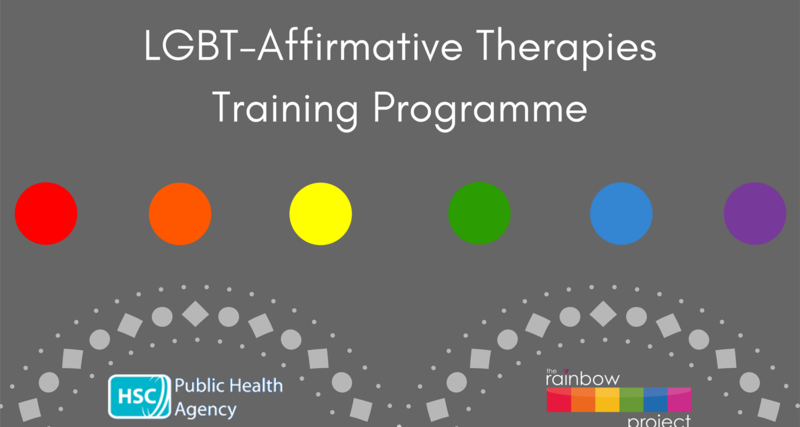 The training programme is funded by the Public Health Agency, and is free for participants. It will run from 10am-4pm, and lunch will be provided by The Rainbow Project. If you would like to register for this training programme, please contact gavin@rainbow-project.org and please identify if you have any access needs or particular dietary requirements. I went on this when it ran in Derry and would recommend it to anyone. Was a lovely relaxed learning experience which allowed conversation and exploration and I really enjoyed it so if you can go then do! Brilliant training. So informative and enjoyable. Extremely knowledgeable, supportive and open trainers. Practical tips and guidelines were particularly useful. I have LGBT friends and have always been supportive but this training opened my eyes to things I’ve never thought about before. Very helpful. The trainers were supportive and honest. Put everyone at ease and answered every question. Great training.